More than a million people use Munich's public transport system very day, in 2009 the figure traveling on buses, trains and trams reached 500 million; the Munich Transport Company (MVG) published these figures in March. And since parts of the underground network are up to forty years old (the first section was opened in 1971) it stands to reason that some sections need to be modernized and overhauled from time to time. Some passengers must have felt rather overwhelmed by the retro-chic of the 1970s that prevailed underground. High time for a makeover. Then new stations were added in the course of expanding the network. 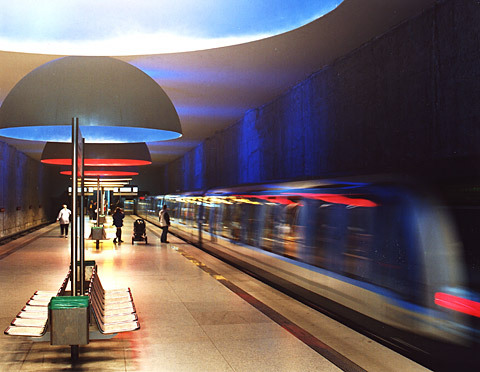 As early as 1998 the MVG commissioned lighting designer Ingo Maurer with illuminating the platforms and the Park & Ride area for the underground station Westfriedhof on the U1 line, designed by the architects Auer+Weber and the municipal Underground Department. 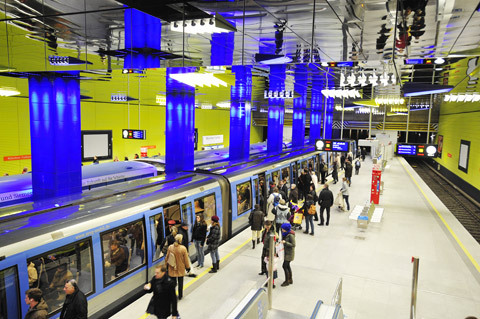 Today, tourists and locals alike see it as Munich's most attractive underground station. What Ingo Mauer achieved at the Westfriedhof station is a far cry a drab, anonymous transport hub. At the border between the Nymphenburg and Neuhausen districts he created a place with its very own, agreeable atmosphere. A place that conveys pleasant emotions, unlike many of the other stations where the underground passages illuminated by neon light typically leave passengers feeling oppressed and uncomfortable. The designer realized his brief of presenting the space in a new, pleasant light and upgrading it. Above the platform Maurer and his team installed eleven concave aluminum luminaires each measuring 3.80 meters in diameter with differently lacquered interiors. Like the oversized heat lamps in an incubator. They elevate the platform to a stage and immerse it in a warm light. Rather than feeling exposed, the waiting passenger feels a sense of protection. One year later in 1999, in the east of the city the Moosfeld station on the U2 line was opened. Planned by Kessler + Sturm in collaboration with the main section of the Building Department, the Underground Construction Unit, a horizontal buckle in the walls occasioned by the topography defines the space. 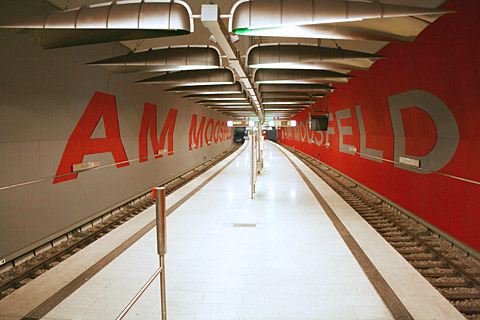 The words "Am Moosfeld" stand on the walls in red lettering on a gray background, and gray lettering on a red background on the opposite wall. Starting from the middle of the ceiling Maurer and Team installed eighty shovel-shaped reflector shades, arranged in twos, which focus and strengthen the light. They hang perpendicular to the lettering on the walls, the platform and the tracks and as such reduce the motion of the station. Moreover: "An ecological aspect to be achieved was to realize for the underground station Am Moosfeld a prototype whose illumination used a low level of electricity. Just 5.4 kilowatts of electricity are needed to light the 120 meter long platform. That is a saving of 40 percent," explains the Construction Department's press office. As with the Westfriedhof station the idea was "to get away from the customary lighting parallel to the platform". The latest coup in Maurer‘s underground trilogy is the Münchner Freiheit station. 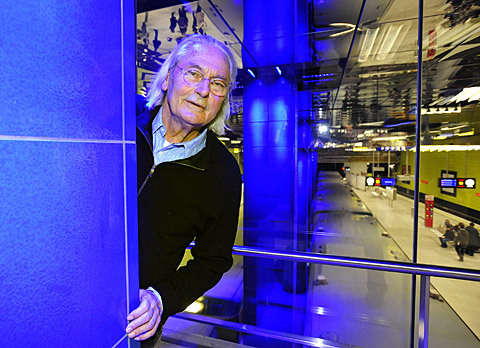 In this instance, he was to re-design and modernize an existing station, thus distinguishing it from the two previous assignments: The brief was to create a new light and surface design. 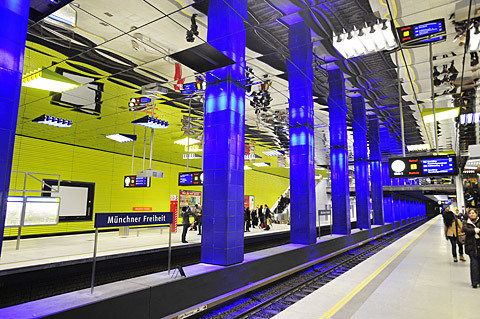 "In the Münchner Freiheit station the aim was to lend the station a fresh, cheerful character as the terminus of the new tram line 23," says the Building Department. Installing 3,200 mirror elements on the roof illuminated by 204 square caissons created a sense of greater openness and lent the space active plays of light. 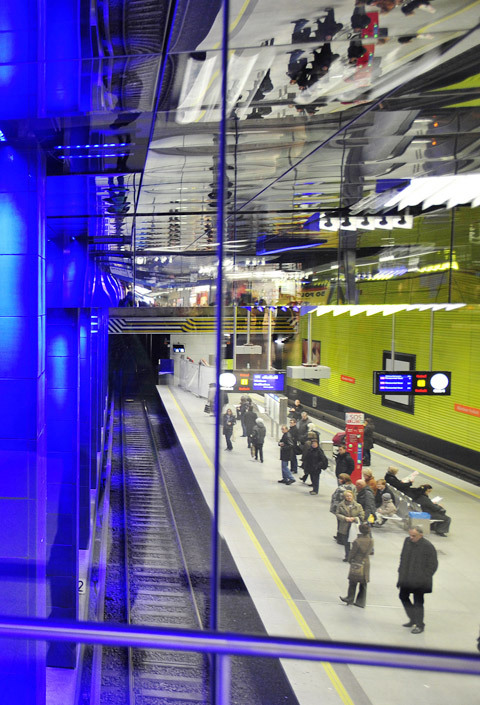 Two colors dominate the scene: The cobalt blue and LED illuminated columns created a clear complementary contrast to the greenish yellow of the walls. Mauer was pleased with the result calling his light-color-concept "provoking and entertaining. Both the Stadtwerke München (Munich utilities department) and the Building Department expressed their approval of the successful collaboration with the lighting designer. 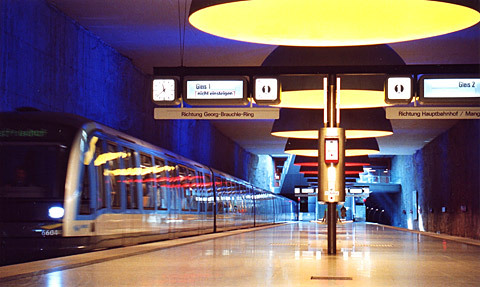 "In 1995 we asked Ingo Maurer to create a light design for Westfriedhof underground station. The result of this highly positive collaboration, for which the Association of German Architects also voiced its approval led to the other two projects."